variations of the addition model . There is no single best way to draw good mathematics models to help you or your kids solve the problems on hand, choose the one that appeals to you most or rather one that you can understand best. Do bear in mind that the model drawn is merely a tool to help you break down the problem into smaller parts, see the relationship between the parts and arrive at the number sentence (i.e. 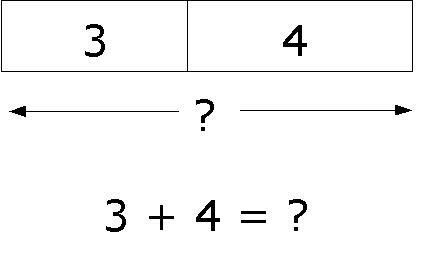 3 + 4 = ?). The questions presented here are intentionally made simple to assist you in your understanding. You can proceed to more complicated questions once you are comfortable with the method. 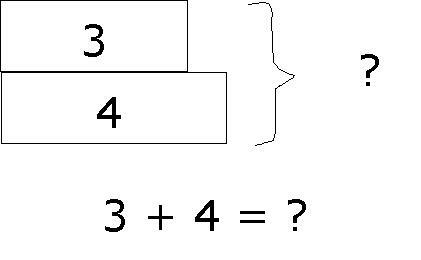 To add 3 + 4, draw two boxes, one to represent 3 and the other to represent 4. For this model, there are a few ways to draw it. They are presented below. You may choose the one that you like most. From the model, we arrived at the conclusion that the unknown value (?) 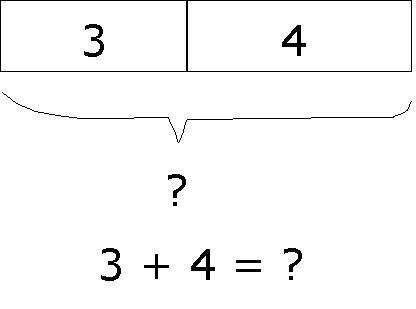 can be calculated by adding the two boxes with known values (3 and 4). 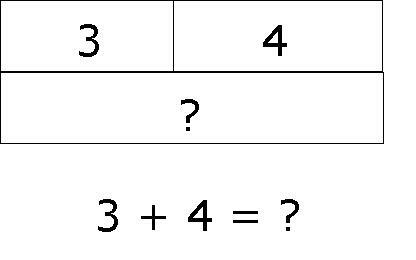 Hence, we formulate the number sentence ======> 3 + 4 = ? Other ways to draw the add model are presented below.